﻿As is well known, early relationships are not always blessed, and it is certainly no secret that the collaboration between Aretha Franklin and Columbia’s record producer John H. Hammond did not last long. Hammond’s later attempts to candy Franklin’s irrepressible natural voice with sugary arrangements and studio gimmicks did not go down well with the public. On the first Franklin disc from Columbia, however, it was honeymoon all the way. With a successful mix of pop and jazz standards, the super talent – Aretha had just turned 18 years old – brought her vocal chords to vibrate. Fired on with youthful élan, these evergreens sound so fresh, new and intoxicating that the question of their genre is quite irrelevant. From a seesawing R & B ("Won’t Be Long") via bell-like waves of melody ("Over The Rainbow") right up to the freely styled, jazzy Gershwin classic "It Ain’t Necessarily So" – everything is right there! The Ray Bryant Trio – augmented with winds – proves itself a formidable ensemble with true presence yet unobtrusive accompaniment. 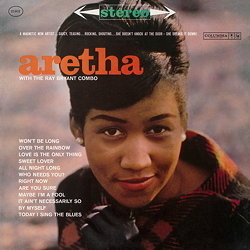 If you compare the mature performances of Aretha Franklin in her subsequent years with Atlantic (Atlantic SD7205), you will soon recognize that the later 'First Lady of Soul' was in full command of her profession right from the very beginning.